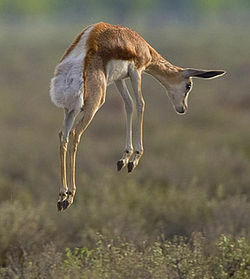 Stotting (or pronking) is a behaviour of some bovines, particularly gazelles. They spring into the air, and lift all four feet off the ground simultaneously. Usually, the legs are held in a relatively stiff position and the back may be arched with the head pointing downward. Many explanations of stotting have been proposed. At least in some cases it is an honest signal to predators that the stotting animal is not worth pursuing. A good means of rapid escape or jumping over obstructions. This cannot be true in Thomson's gazelles because they do not stot when a predator is less than about 40 m away. An anti-ambush behaviour: animals in tall grass may leap into the air to detect potential predators. An alarm signal to other members of the herd that a predator is hazardously close thereby increasing the survival rate of the herd. A social behaviour, making it more difficult for a predator to target any individual during an attack (much like the suggestion that zebra stripes cause motion dazzle). An honest signal of the animal's fitness. Stotting could be a way of deterring pursuit by warning a predator of the animal's unsuitability as prey: the prey benefits by not being chased (because it is in fact very fit); the predator benefits by not wasting time chasing an animal it is unlikely to catch. An instance of Amotz Zahavi's handicap principle: stotting is signalling to predators that the animal is so fit it can escape even if it slows itself down with some apparently useless behaviour (i.e. stotting). A predator detection signal: the animal signals to the predator that it has been seen and therefore does not have the advantage of surprise. Many such signals exist in different groups of animals. Again, this would be an honest pursuit deterrence signal, benefiting the prey by not being chased and benefitting the predator by not wasting time stalking prey when it has already been seen. Evidence for this hypothesis is that cheetahs abandon more hunts when their gazelle prey stots, and when they do give chase to a stotting gazelle, they are far less likely to make a kill. However, gazelles stot less often to cheetahs (which stalk and would therefore probably give up when detected) than to African wild dogs, which "course" (chase prey relentlessly, not relying on surprise). A fitness display to potential mates in a sexual selection process rather than a defence against predators. Play, especially in young animals, may help to prepare them for adult life. Stotting is sometimes observed in immature animals, but stotting is generally seen in adult prey responding to predators. The English evolutionary biologist John Maynard Smith concludes that "the natural explanation is that stotting is an index of condition and of escape capability", used as a signal especially to coursing predators. He also observes that "it is hard to see how it could be a handicap", unless perhaps it is a signal to other gazelles of the same species. ↑ Anon (19 June 1986). "How the cheetah lost its stotts". New Scientist: 34. https://books.google.com/books?id=m5UYyI5YgokC&pg=PA34. ↑ 2.0 2.1 2.2 2.3 Alcock J. 2009. Animal behavior. 9th ed, Massachusetts: Sinauer Associates Inc.
↑ 3.0 3.1 Caro T.M. (1986). "The functions of stotting in Thomson’s gazelles: some tests of the predictions". Animal Behaviour 34: 663–684. doi:10.1016/S0003-3472(86)80052-5. http://www.sciencedirect.com/science/article/pii/S0003347286800525. ↑ 5.0 5.1 5.2 FitzGibbon C.D. & Fanshawe J.H. 1988.. "Stotting in Thomson’s gazelles: an honest signal of condition". Behavioral Ecology and Sociobiology 23 (2): 69–74 . doi:10.1016/S0003-3472(86)80052-5. http://www.sciencedirect.com/science/article/pii/S0003347286800525. This page was last changed on 31 August 2017, at 12:35.